Tell your doctor your medical history especially of: any liver or kidney disease, blood disorders, ulcers, heart disease, alcohol use, high blood pressure, eye disease, asthma, nasal polyps, any allergies - especially aspirin/NSAID allergy (e.g., ibuprofen, celecoxib). Use caution when performing tasks requiring alertness. Limit alcohol intake as it may intensify the drowsiness effect of this medication. This medicine may cause stomach bleeding. Daily use of alcohol, especially when combined with this medicine, may increase your risk for stomach bleeding. Check with your doctor or pharmacist for more information. Do not take aspirin without consulting your doctor. Check the ingredients of any nonprescription medication you may be taking since many cough-and-cold formulas contain aspirin. Caution is advised when this drug is used in the elderly. This medication should be used during pregnancy only if clearly needed. Discuss the risks and benefits with your doctor. Use of this drug in the last 6 months of pregnancy is not recommended. 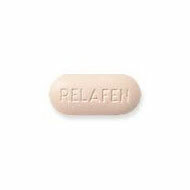 It is unknown if relafen is excreted into breast milk. Consult your doctor before breast-feeding.